For more than 20 years, Israel has been in the throes of a painful, frustrating and extremely bloody peace process. What began with a handshake on the White House lawn between Israeli leaders who were blinded by promises of peace and Arab terrorists who were clever enough to smile when their hearts contained nothing but evil, has become a parody of peace. For instead of peace, despite painful withdrawals and concessions on Israel’s part, Israel has received nothing but terrorism and bloodshed and, more recently international isolation and overwhelming condemnation of an unprecedented nature. If it was ever viable, the peace process is certainly dead today. Recent attempts to breathe life into the process have been greeted with a consensus of cynicism in Israel. Israelis are tired of peace talks. Israelis are tired of broken promises and international condemnation. Israel just wants to live and be left alone. Israel has suffered through too many disastrous experiments with its land and people. International condemnation has focused incessantly on the settlement movement. The 430,000 people who have made their homes in Judea and Samaria, often referred to as the “West Bank” have been roundly condemned as colonialists and violent extremists. But the truth is far different. Judea and Samaria are the heart of Biblical Israel and the people who have settled there have come home in the truest sense of the word. Modern villages, towns and cities have sprouted up alongside the biblical sites so familiar to readers of the Bible: a cluster of communities located on the mountains surrounding Shiloh, where the Tabernacle stood for 369 years; Har Bracha, (“Mt. of Blessing”), located on Biblical Mt. Gerizim; Shavei Shomron (“returning to Samaria”) across the road from the ancient capital of Samaria; and Tekoa, located near the ancient town where Amos prophesied. These communities and so many more are a testament to the deep significance attached to Jewish settlement in Biblical Israel. The Jewish people, after thousands of years of exile, have come home to their Land. Despite the protests of their Arab neighbors and of the nations of the world, the brave pioneers of biblical Israel have remained firm in their conviction that this is their land – theirs to settle and make green once again. The seeds of withdrawal were first sown in 1993 with the launching of the Oslo Process, the series of agreements which transferred land to the Palestinian Arabs. Rather than encourage peace, the withdrawals that began with the first Oslo accords and continued through disengagement, have sent a clear message to the Arab world that terrorism pays. In the wake of this development, it is no wonder that the Arab world continues to view Israel as an enemy nation that must be destroyed. 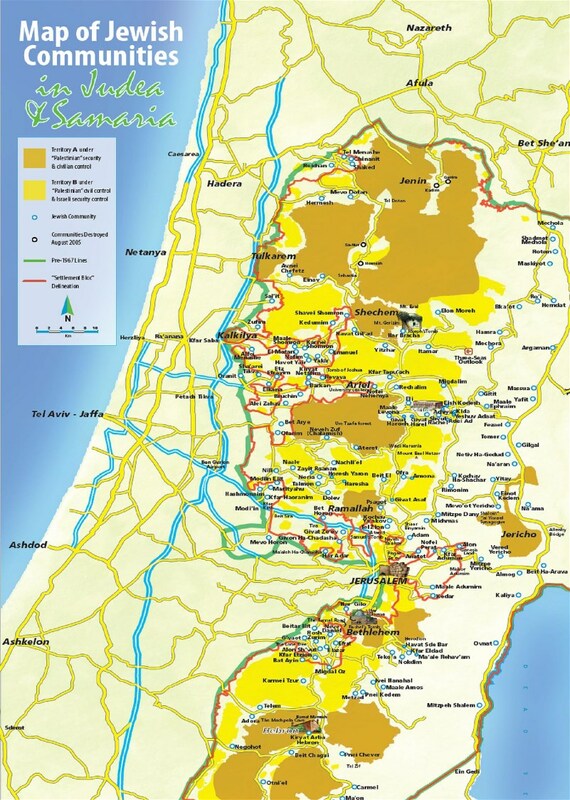 The map of Israel reflects the staged transfers of land from Israel to the Palestinian Authority since 1993. Area A refers to land that was transferred completely to the Palestinian Authority (“PA”). These areas became terrorist hotbeds of activity and it was only in 2003 that the Israeli army began entering these areas in order to combat the terrorism threat. Area B includes land that was jointly controlled by the PA and Israel; here, too, most of that cooperation was destroyed in 2000, although the PA is still responsible for all civilian issues in both areas A and B. Recently, the PA has begun to cooperate with the IDF to keep the area safe, for both Arabs and Jews. But it is clear to both Arabs and Jews that without a strong IDF presence, terrorism would once again rear its head with more power than ever before. Area C is still within exclusive Israeli control. All remaining Jewish communities in Judea and Samaria as well as the main roads leading to them, remain within Israeli control, although many are isolated and surrounded by Palestinian-controlled areas. On August 17, 2005, Israel began the painful and devastating process of withdrawing from the Gaza Strip and forcibly removing the 9,000 Jews who had lived there for decades. In addition, hundreds of Jews were evicted from four communities in Northern Samaria: Homesh, Sa-Nur, Kadim and Ganim. On September 12th, less than a month after the process had begun, Israel closed the door on the Gaza Strip, and abandoned an area that it had possessed for 38 years. Within a few months, the Hamas had taken over the area and began a steady barrage of artillery and missile fire against Israel. In December 2008, Israel responded with Operation Cast Lead, which delivered a devastating blow to the terrorist infrastructure that had been amassed in Gaza. In late 2012, Hamas again launched attacks against southern Israel which resulted in the IDF Operation Pillar of Cloud, which saw Hamas attacking Tel-Aviv and Jerusalem before a cease-fire was reached. As we contemplate the horror of disengagement, and the increasing isolation of Israel, it is clear that the people of Israel stand poised on the threshold of a crucial time in the history of their nation and, indeed, of the world. Will the land remain in Israel’s hands? Will the people continue to settle its beautiful interiors, its biblical landscapes? Today, there are more than 150 Jewish communities in Judea and Samaria with some 360,000 residents. There are schools, businesses, factories, cultural centers and libraries, universities and synagogues, clinics and shopping centers. The mountains of Judea and Samaria and the Jordan Valley are brimming with life. Unfortunately, the future does not bode well for many communities in Judea and Samaria. Powerful political leaders from around the globe are calling for continued withdrawal from Judea and Samaria. This includes the strategic high-ground overlooking the coastal plain where 70% of Israel’s population resides; it includes the mountains overlooking Ben-Gurion Airport, Israel’s only international airport, and it includes the mountain aquifer, one of Israel’s largest sources of fresh water. Many are calling for the establishment of a Palestinian State which would encompass, at the very least, the yellow and brown areas on the map. Others call for the complete withdrawal of Israel from all areas liberated in 1967. In either case, this is a dangerous threat not only to the Jewish people in the area, and to the entire state of Israel, but to free people everywhere. For in withdrawing from these areas, Israel will have rewarded terrorism and, as a result, global terrorism will expand its efficacy and reach. CFOIC Heartland links Christians from all over the world directly with the communities of Judea and Samaria. Churches, ministries and individuals partner with CFOIC Heartland as they tour Biblical Israel, “adopt” a community, pray on a regular basis for their Israeli friends, and contribute to vital community projects. Now is the time to stand up for these communities before it is too late. For it is Bible-believing people all over the world, both Christians and Jews, who are the single most effective obstacle to further withdrawals from Biblical Israel. Raise your voice in support of Israel’s right to her land. Visit the Land and pray for Israel while standing on its holiest sites. Give generously, so that the communities of Biblical Israel may flourish. Forever!